I guess like many I was drawn to the music of Keith Emerson, Greg Lake and Carl Palmer in the early 1970s when I was in my youth, and especially to the Brain Salad Surgery and Pictures At An Exhibition albums. I followed the career of ELP with interest over the years but never got to see them live in that period at all. When the band split up after the Works orchestral tour in 1980 I thought that was it, game over, as it were, but then in 1992 word came of a full blown reunion along with two dates at the Royal Albert Hall (which were recorded for BBC Radio). I was overjoyed to hear this news and eagerly awaited the issue of Black Moon, their first new album in 12 years. That was 25 years ago now and sadly we have lost both Greg and Keith in the last 12 months, leaving Carl Palmer as the last man standing. 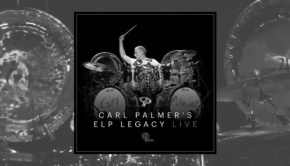 To be fair, Carl is in good health now and has recently undertaken a U.K. tour with his ELP Legacy, playing Emerson Lake & Palmer’s music in a trio format with guitarist Paul Bielatowicz playing Keith’s role in a very effective manner. 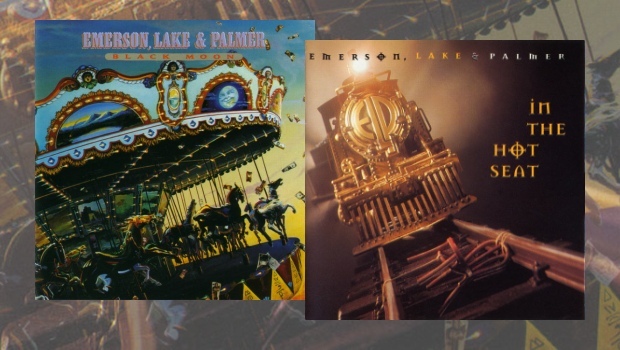 Over the years the ELP canon has been reissued several times by various labels, but when Sony acquired the catalogue they elected to release it all again in remastered versions with good bonus tracks across the albums, which brings us to these final two 1990s albums, Black Moon and In The Hot Seat. The former was well received, the latter was widely panned. This is my attempt to give these two albums a more considered verdict, to see how they stand up today and whether they are worth your time and investment, or are they best forgotten? Black Moon was released in June 1992, originally by Victory Music (a label set up by Phil Carson, ex-U.K. head of Atlantic Records). This Remastered version certainly sounds good with a clear keyboard sounds and balanced bass and drums, as evidenced on the opening title track with Emerson’s synth in prominence with suitably thunderous drums from Palmer. Yes, they may have been older when this was cut but it is still a very strong performance by all, Lake’s voice is in a lower register than in the ’70s, but that’s age for you. Paper Blood is next, a song about the evils of money and the misery it brings to many. It opens with a typical Emerson organ flourish and he is on form throughout, with a nice keyboard solo in the middle and a mouth organ solo, presumably by Greg Lake, in the mix too. Affairs of the Heart is a more traditional Greg Lake ballad with acoustic guitar and sympathetic backing from Emerson and Palmer. It’s a song that still stands tall today, with an especially good synth outro. Then we are on to Romeo and Juliet, an arrangement of Sergei Prokofiev’s 1935 musical setting of the Shakespeare play. It’s a short piece but very effective as it fits well with earlier ELP interpretations of classical themes. Farewell To Arms is a call for peace in a troubled world that still resonates today with its impassioned Lake vocal. Again, it’s a fine song of it’s kind, maybe not vintage ELP but certainly pretty good. The problem is that ELP had one hell of a legacy to live up to and this album, good and welcome as it was, could only hint at that greatness as there are no extended pieces on offer here, which kind of dilutes the impact somewhat. Changing States is another Emerson showcase with some hefty Hammond Organ playing and decent synth work that shows hints of the greatness of those days gone before, but even this isn’t enough to really make Black Moon a great album or totally essential. Burning Bridges, Close To Home and Better Days are all pleasant but not overly memorable pieces, however Footprints in the Snow is a fine ballad with very good lyrics and themes. It seemed that ELP’s inventive well had run a bit dry and this album, despite being good, was not truly great. Very welcome as it meant a return to live work, but on this occasion it was sadly a case of diminishing returns. The Bonus tracks on this disc are a single edit of the title track, very edited versions of Affairs of the Heart, Paper Blood and a heavily truncated Romeo and Juliet. Disc 2 fares far better as it comprises the Live at The Albert Hall album in remastered form, recorded in London on 3rd October 1992 on the tour to support Black Moon (I saw the same show at Birmingham’s Symphony Hall on the 27th November 1992). Opening with a segment of Karn Evil 9 before a 9-minute version of Tarkus, the power and hunger of ELP were always at their best on stage where the real talents of this remarkable trio could be unleashed. This is a good version with Emerson playing those keyboards as if his life depended on it, Lake’s voice soaring above everything, again with real power and conviction. Knife Edge follows, opening with synth, some fine percussion from Carl Palmer and Lake’s growling vocal before a Hammond organ line from Emerson. This is a brooding and menacing piece with a suitably dark mood. It’s a fine performance of a classic song from their 1970 debut album, and it still sounds good today. Paper Blood from the at that time new album is next, followed swiftly by Emerson’s take on Prokofiev’s Romeo and Juliet and his own Creole Dance, again excellent and a piece that shows him still to be one the finest piano players the U.K. has ever produced. Then its Greg’s solo spot with Still You Turn Me On from Brain Salad Surgery, and it’s a fine version that is well received. Lucky Man follows, a chance for folks to sing along before that familiar Moog ending from Keith Emerson is unveiled to rapturous applause. Black Moon‘s muscular riff echoes around the Albert Hall as Palmer’s hefty drums propel the song along nicely. 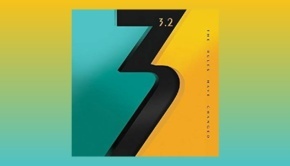 Then comes a moment that many have been waiting for, a 13-minute version of Pirates from Works Volume 1, the trio making this epic piece come alive again with great synth work, a grand vocal and Palmer’s ever solid drums. It’s a great number to close the main part of the set, stirring and well performed before the encores of Fanfare for the Common Man, America and Rondo, all together in a 15-minute medley, the striking opening chords resonating around the Hall. It’s a classic number in every way and shows ELP at their finest in a song that everyone knows and wants to hear played. The band don’t disappoint in a creative version fuelled by Palmer’s thundering drums and Emerson’s majestic keyboards before segueing into the staccato organ of America. With some great Moog soloing this is another fine version, bring this great show to a close. So, the real question, is it all worth it? Well the answer is mixed. If you like ELP then this is a nice package of a nearly great album and a well recorded reunion show bundled together with a decent remastering that frankly doesn’t make that huge a difference, but is still worth a listen. Personally I like it, but then I’m a big ELP fan and this tour was the one I saw so it brings back very happy memories. So, nice to have but not utterly essential. This brings us to the final release from BMG/Sony’s ELP remastered reissue schedule, and the final album from ELP, 1994’s In the Hot Seat, an album made under difficult conditions and one that is, quite frankly, somewhat lacking. As well as being remastered, this version adds bonus tracks taken from European dates on the 1997/1998 Now Tour, which go a long way towards making this a worthwhile release. But first I must address the mess that is In the Hot Seat itself. Many People quite rightly deride ELP’s Love Beach from 1978 as their worst album, with its ‘Bee Gees’ cover and lacklustre song choices. Well this album is at least on a par for badness, run of the mill material and a lack of decent songs severely reining in the talents of all three members. 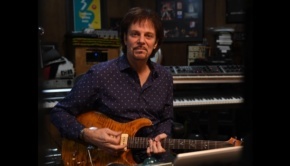 They brought in a ‘hot’ producer in Keith Olsen to work his magic (he failed) and this is really just sad and not a fitting way to draw the band’s career to a close. Keith Emerson was having issues with his playing by then and that was already causing problems within the band, the final insult being that uncredited session men were brought in to play on certain tracks, so much so that Carl Palmer can’t recall playing on much of the album and Greg Lake could not remember certain tracks at all. Plus the three weren’t in the same room to make the album either, all of which adds up to a pretty sorry mess that even a studio recording of Pictures At An Exhibition can’t salvage. Opener Hand of Truth is the strongest piece here, along with Daddy and possibly Man in the Long Black Coat (a co-write with Bob Dylan) is passable, but everything else is dire, well below par, which is very sad. Also, the label was in financial trouble due to the failure of Yes’ Big Generator and Bowie’s Tin Machine project, and thus coerced ELP into making an untypical album. Disc two however, along with the two live tracks at the end of the first disc, do sound very good. The band were on good form and played a strong set of old classics and a few choice cuts from Black Moon alongside great versions of Fanfare for the Common Man/Rondo and 21st Century Schizoid Man/America, amongst others. The sound quality is good throughout and the remaster cleans this up even more, but even so there is still a lot of reliance on musical references to pad out the improvisations, although as said, Emerson was playing below his normal level of skill due to an arm injury. 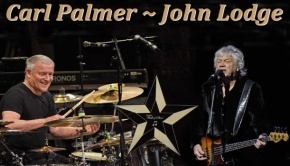 As a document of their last tour this is an adequate reminder of why ELP matter and why they were so widely admired. This is made even more poignant by the deaths of both Keith Emerson and Greg Lake in 2016, robbing the music world of two of its longest serving and affable musicians, both of whom are sadly missed, partly for the missed opportunities they can no longer fulfil but also for their loss as people. In summary, a dreadful album is redeemed somewhat by a sprightly live collection on the second disc.